1. Don’t follow the directions for liquid on the box. They often call for just water, and we all know that water and grain makes paste. 2. Do follow the measurements. The measurements are calculated specifically so that each amount is just right. 3. Don’t skimp on the salt. You don’t need to use much, but it needs some to bring out the flavor. 4. When you bring your hot cereal home from the store, place it into quart jars, or keep it in the freezer. Nothing is worse than going to make farina and finding meal moths in your cereal. They can come home with you on many items from the store, and you may not notice them until they are into other foods in your pantry. 5. Be sure to tape the measurements on the side of the jar. I’ve lost mine a few times when I just kept the instructions with it, or put them in a safe place, and then forgot where that safe place was. 6. Add a little natural cane sugar to the water before boiling. This will sweeten your cereal and ensure it is all dissolved. 7. Be sure the liquid is boiling gently before adding the cereal. It will be goopy if you start with cool or warm water. 8. When adding the cereal, sprinkle it over the top of the liquid slowly and wait for it to all soak up liquid before stirring. Just dumping it in will surely result in lumps. 9. Got lumps? Use a potato masher. 10. What can be used for the liquid? I use part half and half and part water. The half and half provides a nice creamy texture and adds to the flavor. Worried about too much lactose or fat? Try almond milk, rice milk, or cashew milk. All of these can be used in equal proportions to the liquids suggested. 11. Oatmeal can be especially boring. Try adding raisins, cranberries, walnuts, or even hemp meal. There are so many delicious ingredients that will add flavor and texture. 12. Love your granola? Try it hot! Pour a serving of granola into a bowl and add hot milk, or use a milk alternative. Let it sit for a few minutes and enjoy. 13. Want a different flavor? Add some ice cream! When my grandfather was sick, we were told to add ice cream to his diet. We’d melt French vanilla ice cream and use that for half the liquid, then add water for the other part. It’s delicious! Try different flavors for some breakfast fun. I love strawberry and raspberry too. Frozen yogurt and frozen milk alternatives work too. 14. Make your own CoCo Wheats. Use Cream of Wheat and add some cacao powder. To eliminate lumps, add it to the dry cereal and mix well. Cook as usual. 15. Don’t skimp on the stirring. 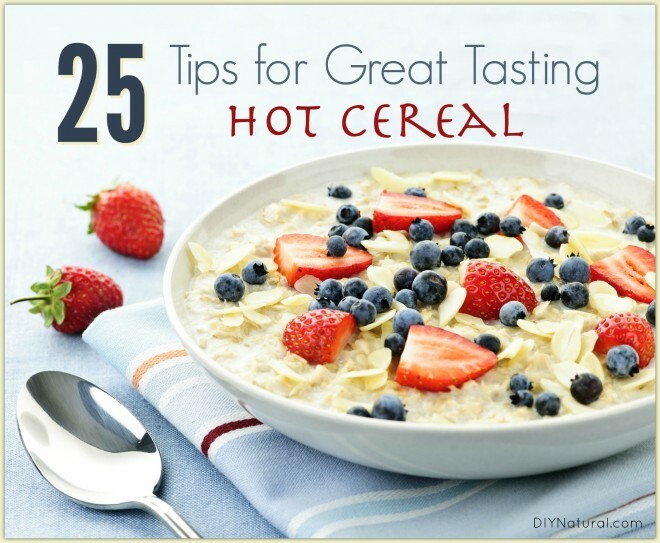 Your hot cereals will surely stick to the bottom of the pan if you don’t stir enough. 16. Watch carefully that the temperature doesn’t get too high when making the cereal. It can burn and the flavor will be all through the cereal, so it’ll be ruined. 17. Make some for your pets too. I use powdered goat’s milk or rice milk to make it for my animals. Use the same measurements and the same cooking method. You can leave out the salt and sugar, but it makes it more palatable. Be sure to cool it sufficiently. No one wants a burned tongue! 18. Have leftover cereal? Cool it and leave it out for the birds. The squirrels love it too! Be sure to pick it up before night time if it’s not gone. Raccoons, opossums, and even bears like it just as well. 19. Leftovers can also be made into cakes and fried like pancakes. Get the cereal really cold before molding it into cakes. 20. Trying to add coconut oil to your diet? Stir a tablespoon or two into your cereal. You’ll never even know it was there. 21. Trying to get the kids to take medication? Some medications, like cough syrup, can be added to the cereal. I love elderberry syrup in mine! Just be sure it can be taken with food, as some medications should be taken on an empty stomach. This works great for liquid vitamins too. 22. Farina makes a great sticky agent for applying seed to pine cones for the birds. Make a batch with just water. Add a tablespoon of peanut butter to the hot cereal and mix. Then add some seed. For each serving, use a cup of seed. Mix well and smear on a large pine cone. Tie to a branch with string. Again, be sure to keep an eye on it because of other critters, like bears (depending on where you live). 23. Make it savory! Don’t add sugar, but keep the salt. When you serve it, add a pat of butter and a spoon of molasses. 24. Sweeten it up! You can add a swirl of raw honey, pure maple syrup, stevia or any other sweetener. For a different twist, try blueberry or butter pecan syrup. 25. Have fun! Only your taste buds will limit you. I tried maple syrup and crumbled bacon not too long ago, and the results were delicious! Just don’t stir the bacon in or it will get soggy. Do you have any tricks for making hot cereal taste great that I missed? Share your ideas below! What is farina? For us, farina (Italian for flour) is just that, flour 🙂 Is it a type of hot cereal? We are always looking for new recipes. I didn’t know what it was either, Adianez, until a few years ago. Farina is the actual name of what milled grain is, so what Cream of Wheat or Malt-O-Meal actually is. And yes, it is wheat, although not ground as fine as flour. More like finer corn meal. Semolina is most commonly used. I’ve been eating Malt-O-Meal since I was a kid, and didn’t know until recently that it was farina. I used almond milk in my oatmeal and add chia for the the added protein and Omega-3. Often oatmeal doesn’t give me enough fuel and this helps. Of course, Lyn, chia! I just wrote an article on chia not too long ago. Thanks for the reminder! I rinse and drain organic oats then cover them with Cocunut Milk, Almond Milk or Rice Milk, add some ground almonds and ground linseed, about 1 tablespoon each and mix in. Then I leave overnight covered on the stove. Next morning, I turn the oven on low and gently heat up oats. Delicious with a spoon or organic yogurt or honey, as you wish.Enjoy. I’ve never done an overnight recipe Mary, but I can see I’ll have to try it! Thanks!